The weather has gotten colder here. Not cold enough for snow, but cold enough that I use my electric blanket at night and I need my coat to walk down the halls at school. Ugh. Can't wait for 5 months of this. Despite the chill in the school, the air outside is crisp (since it's always colder in the school...), which I enjoy, so my walks to school have been pleasant. School is back to normal after sports day and a slew of field trips, so I'm settling back into my old routine. On Tuesday before Korean class, Cesca (who just started classes) met up with Lauren and me for some pre class tacos. Yum. Wednesday is special lunch day! Ddeokbokki and chicken porridge. Yuuuum. This weekend was rather jam packed, as all of the teachers from my school gathered up to go on a trip. It was called a workshop, but I think it was more like team bonding or something. Anyway, Young Ah was supposed to come and essentially be my babysitter, but she got really sick right before the trip and had to go to the doctor instead of coming. My other co teacher had a family thing, so he wasn't coming, and my handler was thinking of skipping. Soooo every time someone mentioned these facts, I heard "but what will Christina do?" or "What about Christina??" Thankfully, my handler came, and some of the old subject teachers helped babysit me during the trip. I don't really mind being alone, I came to Korea knowing I'd be moderately isolated by the language thing. But everyone was really helpful. so I had a great time. We stopped to see the place where King Danjong (sixth king of the Joseon Dynasty, forced to abdicate by, and later murdered on orders of, his uncle) was exiled. He was like 17 when he was poisoned and killed. He was only 12 when he ascended the throne. I think his grandfather was King Sejong. Everyone drank a lot, but at my table, we didn't (my handler doesn't drink, and the other two at the table didn't really want to drink a lot). Sooo by the time we went to the noraebang, everyone was really, uh, excitable. So, after being pushed by Hae In, I decided I would up my noraebang game by singing Fantastic Baby by BigBang, because I 'd been kind of practicing it. Turns out, I apparently did a decent job, because I got lots of appreciation from my co workers. It was really exciting and I'm glad I got pushed to do it. We stayed over at a ski resort, since Gangwondo is famous for mountains and skiing in the winter. We got a big discount, I'm sure, for coming in the off season. My Phantom brain was freaking out at this, since in the novel, Christine's room in the Phantom's lair is called the "Louis-Philippe Room." Therefore, I was dyyying when I saw these chairs at breakfast. They told us we needed safety helmets. The cave walk was about 1 km, and it was very fun but scary. I felt like we were in the movie "The Descent" or something. Sometimes the path was so small I was almost crawling. That's low, man! There was inexplicably a fountain inside...? I only hit my head once. Lunch was a special type of bibimbap and bulgogi, so I of course stuffed my face. Then we took taxis up the mountain, Min Doong San (which means No Tree Mountain, named as such because there are, you guessed it, no trees at the top). We had to climb the final 30 minutes ourselves, but thank GOD we had those call vans. The 30 minutes were a grueling, steep hike up, and thankfully everyone else was as exhausted as I was, so we were a chorus of complainers the whole way up. It's always worth it at the top though. Nothing bonds people together like exhaustion and climbing up a freaking mountain when half the group is hungover. On the way home, they gave out lottery prizes on the bus. I won some face masks!!! I even got to try some Korean. My speech was half English, have Korean. I said "Wow, I love face masks! This trip was so fun!" in English and then in Korean I attempted to say "When I came to Korea, I was very nervous. But everyone at school is so nice, so I am very happy. Thank you!" In the midst of this, a hiker asked to hitch a ride on our bus because hers had left. Turns out she thought we were going south to Daegu. And that her group was STILL waiting at the rest stop we left like 50 minutes ago. So we dropped her off at the next rest stop for her bus to get her. She'd gotten turned around at one of the rare rest stops for people going both north and south. Then, about 10 minutes later, we passed a super big fire! It was a tour bus! On FIRE! Weirdest bus ride home ever. But, the promise of beautiful fall weather and the fact that Cesca hasn't seen Namsan Tower yet weight heavily on my heart and mind, so I hauled my sore self out of bed on Sunday to meet up with her and show her one of Seoul's most famous landmarks. we found the cool sword dance guy after. Then we went up the tower! 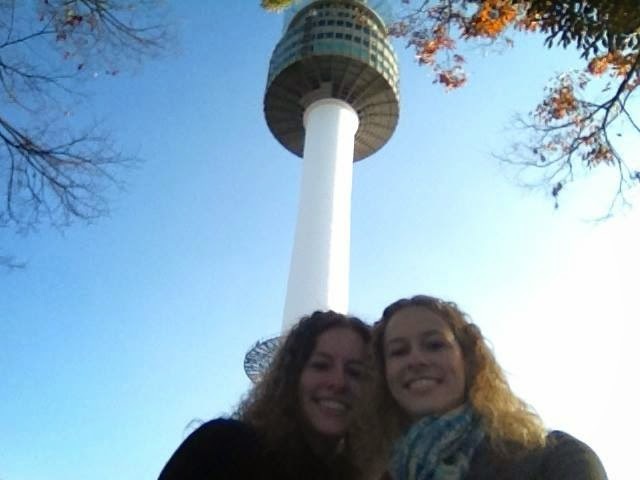 First trip to N. Seoul Tower was a success! am happy I got to see it in the fall! Whew, that was a long one! What a long, not restful but very fun weekend. I got to bond with my teachers/co workers, saw some historic things, explored a cave, climbed a mountain, saw a cool demo and got to visit a beautiful place with my beautiful sister. What could be better? The weather's getting cooler, but my heart feels warm and fuzzy after spending the weekend with my school, all of whom were very nice and friendly with me, and with my sister and friends. Lately, I've been obsessed with this song. Originally done by Super Junior's ballad group KRY (Kyuhyun, Ryeowook and Yesung), it's on their new repackage This Is Love. It's a sad song, but it's always stuck in my head. Their voices are sooo beautiful. This is another one on the repackage that I'm obsessed with. I must like sad ballads lately. Hoping that my students take pity on me and my sore, tired body. Probably wishful thinking... Sigh. At least I hope this week will go fast!